The Vietnam Social Security (VSS) said that the health insurance premium of students is equal 4.5 per cent of base salary and the State Budget supports 30 per cent of the premium and students pay 70 per cent. Accordingly, insurance policyholders are students studying at educational establishments, except for those who have participated in health insurance applied to other groups of the insured. The register of their health insurance is their educational institutions/schools where they are studying. Premium payment is 3-month, 6-month or 12-month terms and is collected at their schools. Health insurance cards will be given to students within five days their schools send the list of registered insurance holders to social insurance agencies. The insured students are entitled primary healthcare at their schools (first aid, initial treatment in case of injury and common diseases at school); medical check and treatment, rehabilitation, periodical pregnancy examination and childbirth; medical care and treatment in case of suicide and self-injury; medical care and treatment in case of physical or mental injury caused by their acts of law violation; transportation costs in case of emergency or inpatient treatment prescribed to be medially treated in a higher level of hospital; and payments for medicines, chemicals, medical equipment and medical technical services in proportion and conditions of coverage prescribed by the Minister of Health. As for the coverage, if medical check and treatment is started from the registered medical unit, the full coverage will be applied to the following cases: Students hold cards such codes as BT, HN, DT, DK, XD and TS; medical check and treatment is serviced at the commune-level clinic; total cost of a medical check and treatment is less than 15 per cent of the base salary (currently VND208,500); and students pay health insurance premiums in five straight years or more and the coverage payment is greater than six-month base salary (VND8.34 million). The 95 per cent coverage for medical check and treatment will be applied to students holding insurance cards with such codes as TC and CN; and the 80 per cent coverage is applied to such codes as HS, SV, TA, TQ, TY and TV. In case students register initial medical check and treatment at commune-level clinic or district-level hospital, they will get the above coverages for medical check and treatment at commune-level clinics or district-level hospitals in the same province. Students with insurance cards carrying the codes DT or HN living in economically and socially poor/extremely poor areas and students with XD-coded insurance cards registering medical check and treatment not at their registered district-level hospital or having inpatient treatment at provincial or central hospital, the above coverage levels will be used as well. In case of emergency, medical check and treatment at any medical unit will have the above coverages. When the medical check and treatment is not started from the registered unit, the coverage will be 40 per cent of inpatient treatment costs at central hospitals; 60 per cent at provincial hospitals as of December 31, 2020; 100 per cent from January 1, 2021 onwards in the whole country; and 100 per cent inpatient and outpatient treatment costs at district hospitals. If students cannot show required insurance documents, their medical check and treatment will be paid directly by health insurance funds across the country. According to the Vietnam Social Security, to have all students insured in 2018 and beyond, it requires provincial social insurance agencies to actively report and advise the Provincial/Municipal People’s Committees to issue instructions to student health insurance to schools. Particularly, it requires local universities, colleges and secondary vocational schools to expand health insurance for students, especially students from the second year on. Education and training authorities assign the rate of health-insured students to each school and use the adoption rate of health insurance as one of assessment criteria for grassroots unit classification. VSS strengthens communications and disseminates policies on health insurance to engage students to adopt health insurance; review and classify the list of uninsured students and nearly expired insurance policyholders to mobilise them to adopt full health insurance. It collaborates with the education and training sector to organise meetings to review, disseminate and communicate on policies on health insurance to all schools; issues documents guiding local schools to collect health insurance premiums according to regulations. In case students extend their health insurance, social insurance agencies record the new value of their health insurance cards into the database and print the list of health insurance cards (form D10a- TS) appended to Decision 595/QD-BHXH dated April, 14 2017 of the General Director of the Vietnam Social Security on the issuance of the process of collecting social insurance, health insurance, unemployment insurance, labour accident insurance, occupational disease insurance; managing social insurance books, health insurance cards sent to schools, and continued use of health insurance cards with social insurance codes thereto. For cases where students have not been granted social insurance codes, they shall declare their registration declarations, modify information on social insurance and health insurance (Form TK1-TS) appended to Decision 888/QD-BHXH dated July 16, 2018 of the General Director of the Vietnam Social Security on amendments to some articles of the Regulation on collection of social insurance, health insurance, unemployment insurance, labour accident insurance, occupational disease insurance; management of social insurance books and health insurance cards issued with Decision 595/QD-BHXH dated April 14, 2017 of the General Director of the Vietnam Social Security, and issuance of health insurance cards with social insurance numbers under Decision 595/QD-BHXH. 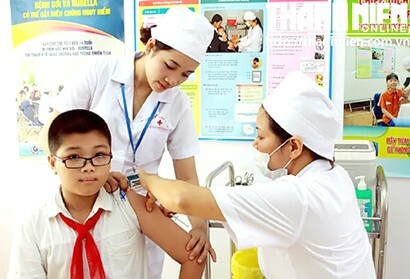 The Vietnam Social Security timely ratifies, extracts and transfer remunerations for collection of health insurance premiums from students, determines and transfers the initial health care fund to schools according to the law.